Acrobazia is an unbelievable (6-7 min.) physical performance, staged to an original music score, that defies the laws of human possibility. Jean-Francois Martel of Acrobazia also offers his impressive Mystic Cube presentation, which is available alone or in addition to "Acrobazia." 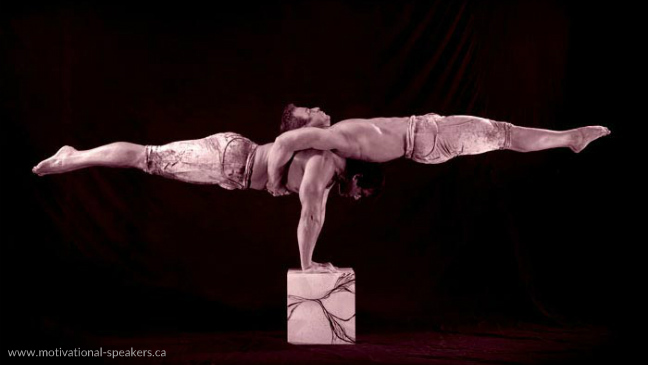 This duo, composed of former gymnasts Guillaume and Jean-François Martel, have created an act of pure strength and balance that is widely considered to be the finest act of its kind in North America. Internationally acclaimed, among their numerous career achievements, they were guest stars in MYSTERE by Cirque du Soleil in Las Vegas, performed at the India Film Awards in Bombay, were part of the XXXIV Super Bowl, invited three times at the Grandstand Show of the Calgary Stampede and astounded thousands of fans at NBA half time shows. Your organization relies on teamwork, motivation, performance, strength, trust, achievement, motivation, power and balance - all attributes which Acrobazia symbolizes. Acrobazia are represented by K&M Productions. For more information, fees & booking Acrobazia, contact us. The best half time act we had in years! We couldn’t have found a better way to represent the STRENGTH of our company. Acrobazia was a huge hit and the feedback has been great!